When referring to Jacob Jensen’s revolutionary designs for Bang & Olufsen, people rightly talked of a “mature Modernism”. However, Jensen certainly does not round out the idea that form must follow function. The Modernism of the objects he has designed appears to be matured because he places limits on himself: He never throws caution to the wind when staging new products, but always combines them with familiar elements. Thus his designs insist aesthetically on their originality, but do not exaggerate it. This, too, sets them apart from the arbitrary ephemeral nature of many current audio products. Even a magician needs customers. Jensen always knew how to gain new ones – and to this end banked on a synthesis of classic-modern Danish design and a futuristic language of technology. To develop them, he drew on different sources: on the one hand, Bauhaus idealism, including the credo that form must follow function; on the other hand, he took to heart Raymond Loewy's rule of the "most advanced yet acceptable", i.e., he designed his products to be as progressive as possible at the same time as being acceptable. About his own work, he says what he makes is, "different but not alien." Perhaps this is the reason that Jensen never regarded technical innovations as a barrier to his creative drive.ldquo;If a new idea is right”, so Jensen, “there is always a way to realize it. 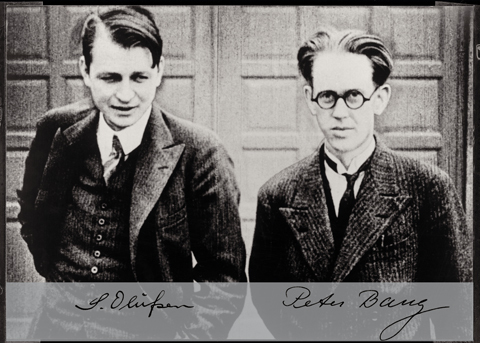 And when people are so enthusiastic about an idea that they say, ‘We have to have that!’, there is always a way to realize it and to create something extraordinary and novel.” Thus, he never opposed the engineers, but rather, on the contrary, he encouraged them to seek solutions to certain problems. In this way, without having to forgo their potential, he was able to concentrate on making use of new technical possibilities and functions, yet at the same time limiting them aesthetically in their dominance. The result of this is that clearly designed exterior surfaces always conceal a rich technical interior. Perhaps it is even in this that the essential element of Jensen’s design language lies, namely, that it does not lose itself in technical gimmicks with countless buttons, dials and displays, but transforms the product’s technicality into something natural. Jensen always knew what consumers need. He leaves everything else out, i.e., he makes it invisible, conceals it. In terms of the design of the 1960s to the 1980s, the company Bang & Olufsen, founded in 1925, is something like the Danish version of Braun in Kronberg, and Jacob Jensen quasi the Danish Dieter Rams. Whereby it almost seems as though Jensen understood the question of functionality in its significance for the consumer in an even stricter sense than Rams. If we were to carry Jensen’s achievement in the field of modern hi-fi systems forward to today, we could probably only compare it with that of Jonathan Ive for Apple. 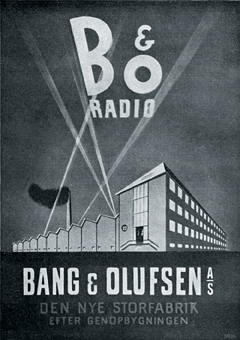 Bang & Olufsen, founded in 1925 by Peter Bang (1900 - 1957) and Svend Olufsen (1897 -1949), certainly did not champion design from the very start. Its first product, from 1926, was a black box, clad in perforated sheet metal on the sides, with dials and six connector sockets , the so-called “Eliminator”, a mains adapter which looked as though it belongs to an antiquated model train set. The new beginning – the factory was blown up in an act of sabotage in 1945 and rebuilt after the war with funds from the Marshall plan – was also difficult. 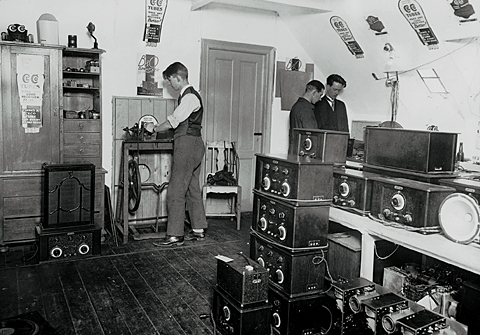 The company kept on course with studio equipment, microphones, cinematic facilities and radios but, in the face of growing competition from abroad, slithered into a crisis at the end of the fifties. Aside from the “Hyperbo 5 RG Steel” of 1934, an art deco-style radiogram which made reference to Marcel Breuer’s steel tube furniture and Eileen Gray’s elegant tea trolley and, instead of wood grain, used strict black and shiny chrome, and the streamlined “Beolit 39” of 1938, the design is not particularly striking. In 1954 the architect Poul Henningsen startled the company with a harsh critique of its design and labeling its products as “monstrosities” made of “idiotic wood”. The blow hit home. 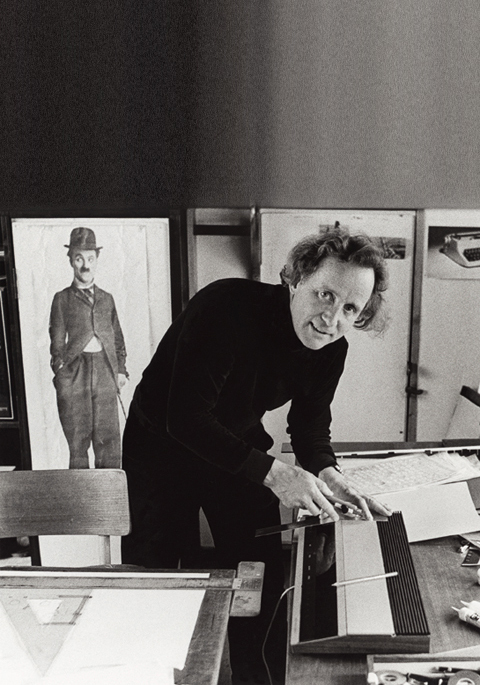 The orientation shifted: From then on, they worked with renowned architects and designers. In the end, the brand repositioned itself. From then on, in the field of stereo systems, Bang & Olufsen stood for Danish quality, geared to a design-conscious target group within a growing market. However, it was Jensen, chief designer from 1967, who made the decisive breakthrough – with the “Beolab 5000”. Although his task was anything but easy, namely, to design a European hi-fi format which communicated its abilities and had its own identity. The silhouette of the combination of tuner and amplifier which Jensen designed is actually unmistakable to this day. 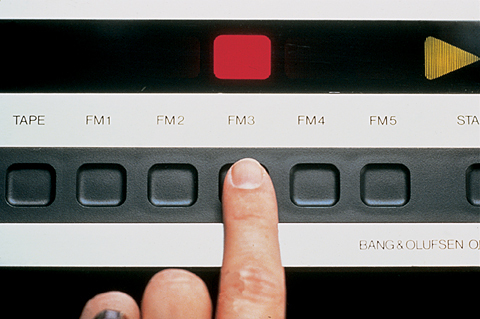 Perfect dials on brushed metal, transparent sliding controls at the top, and at the bottom, in the form of a black line, a row of rectangular switches. The ensemble was completed by cube-shaped speakers, one corner of which balanced on a round metal rod. That was a novel feature at the time, precise operation as with a slide rule, combined with a design which appeared both elegant and technical at once. In the late 1960s, the “Beolab 5000” was the most perfect hi-fi system in the world, both technically and aesthetically. 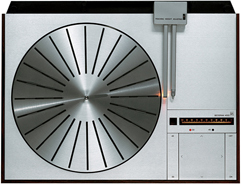 The record player “Beogram 4000” of 1972 advanced to the full status of a design icon. If you look at the player from above, you can immediately see the sophistication with which Jensen designed the few elements (turntable, tone arm and controls) and arranged them on the rectangular, brushed metal base plate. Radiating out as on a clock face, short black lines made of rubber revolve around the empty middle of the circular table – a graphic masterpiece, which still remains unequalled today in terms of simplicity and conciseness. The “Beogram 4000” was a huge success. 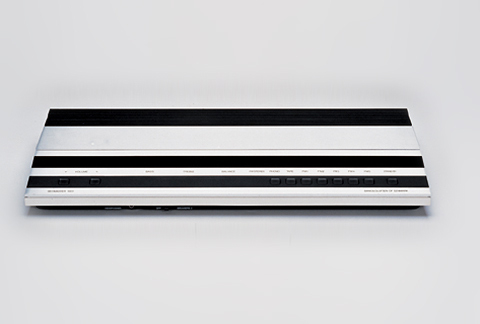 It won numerous international awards and contributed to further strengthening B&O’s design image. With the console-like “Beomaster 1900” (with its markedly futuristic appearance and touch-activated controls instead of sliding ones) in 1975 Jensen succeeded in a further coup. 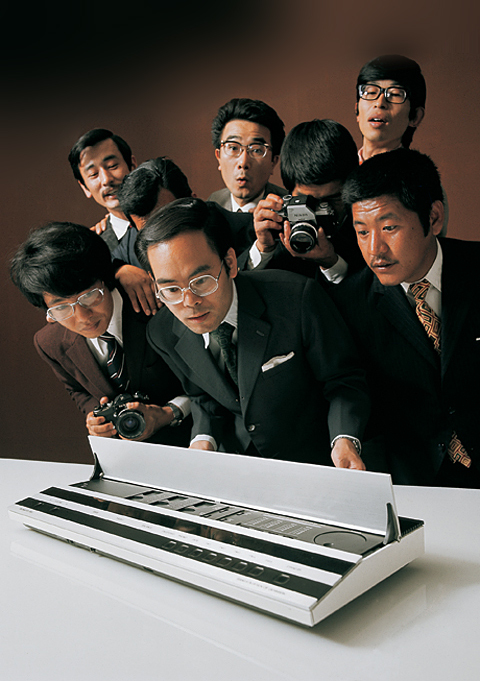 Not only did he resist the temptation to follow the general trend and stack individual components on top of each other to form a so-called “hi-fi tower”, but he also demonstrated how to counter Japanese firms, who had long since dominated the market with uninspired metal boxes full of buttons and dials. The contrast between silver and black also plays a major role in the case of the Beomaster 1900 and, in this case, too, the operating elements that are not frequently used are hidden behind a large metal flap running across the entire width of the unit. The receiver looks its best when it is switched off – then it appears to consist solely of three light and three dark horizontal strips. A typical Jensen design, the Beomaster takes account of the fact that many listeners want music in the living room and not necessarily a large rack of hi-fi units. 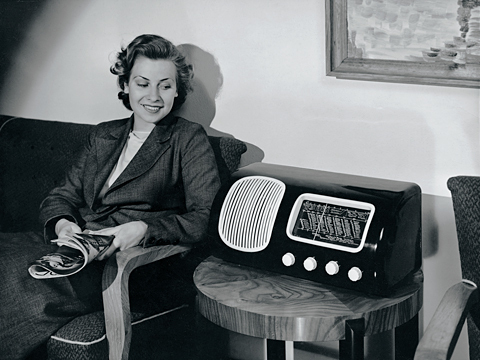 It was not for no reason that the “Beomaster 1900” was Bang & Olufsen’s best-selling model for many years. However, Jacob Jensen, who was born in Copenhagen in 1926 (the “Jacob Jensen Design” studio, which today is headed by his son Timothy Jacob Jensen, is celebrating its 50th birthday this year) has designed much more than just receivers, record players and stereo systems. His telephones, clocks, ovens, windmills, weather station and jewelry, over 500 products in total, are also immediately recognizable as designed by Jensen. Jensen even designed a car.